In our experience, lead nurturing campaigns are often the missing piece of a poorly functioning B2B sales funnel. Picture the ideal sales funnel: sales funnel leads owned by the marketing team flow in through the top, moving smoothly down the funnel’s path and exiting as closed deals owned by the sales team. Sound like a funnel fairytale? 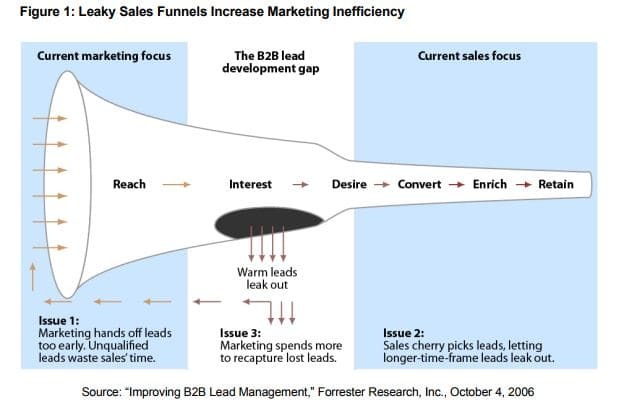 In truth, relatively few B2B organizations have a perfect sales funnel; and most are just a few tweaks away from major improvement. The Truth About Sales Funnel Leads. Most marketing teams are responsible for identifying and developing leads and passing them to the Sales team. These leads come in from a myriad of sources: tradeshows, online campaigns, email or direct mail responses, telemarketing, list buys, etc. The sales team gets those developed leads from the CRM, in spreadsheets or as bundles of business cards. 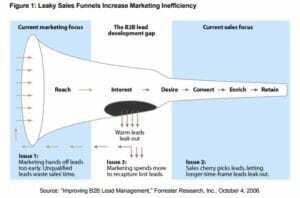 In the fairytale funnel, the sales team would immediately begin working those sales funnel leads to generate more company revenue. When a sales team consistently receives leads of a poor quality, they tend to stop trusting the marketing team. Putting in the effort on leads that aren’t qualified is a waste of time and money. This gap between marketing and sales is very real, and largely ignored. Left unchecked, gaps like this in the lead nurturing funnel result in lack of momentum, decreased morale, and a loss of trust and teamwork between the departments. are experiencing a consistency of poorly qualified leads that lead nowhere; therefore, the marketing team is associated with leads that lead nowhere. As a result, the momentum of leads from marketing to sales to close is interrupted by a lot of gaps in the process. This isn’t a case of the marketing team slacking off or not doing their lead homework of nurturing sales leads. The average team puts a great deal of time and thought into crafting marketing strategies and creating lead-generating campaigns. So when these campaigns result in not-so-hot leads that require a great deal of additional sales legwork to push through the funnel. If you experience this in your business then it’s a pretty clear indication that your sales funnel has a few gaps. While Marketing has met its goal of generating leads for Sales; Sales is making its numbers by ignoring those leads and working their own. In theory, some of these leads might reach Sales, but in practice, it usually only happens when a very large number of leads are coming into the funnel at once. Marketing’s hard work and investments in top-of-the-funnel campaigns cannot produce the expected sales due to funnel leaks. The funnel is missing some pieces, allowing leads to leak out through the gaps. 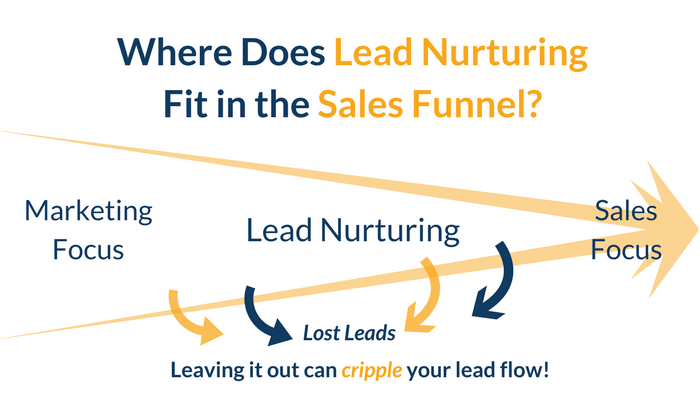 Repair the Funnel With Some Lead Nurturing. Now that you’ve identified a leaky sales funnel, how do you fill in the missing pieces and create a healthier process? The solution is lead nurturing campaigns. Think of the leads generated by the marketing team’s top of the funnel campaigns as the building blocks of a successful qualified lead program. Insert lead nurturing campaigns into the funnel and the process becomes more streamlined, controlled and manageable, even more so when you include controls such as found in many marketing automation platforms. Effective lead nurturing campaigns start by interacting with the top-of-funnel leads and monitoring responses. As the leads interact with your messaging, content, and offers, they progress naturally down the funnel. Response is continually measured and scored, driving subsequent interactions and responses. As the lead nurturing creates further momentum, a level of activity or predetermined set of criteria will identify leads as ready to hand off to Sales. Working with your sales team to determine the timing is critical. Reaching Out Strengthens Your B2B Sales Leads. The expensive offerings and complex sales cycle of a B2B space means that, eventually, someone has to pick up the phone and engage with the prospects expressing interest. This is usually where telemarketing comes in. Many organizations leave this in the hands of the sales team, but that’s not ideal; technically, these sales funnel leads are not quite baked. Telemarketing will secure a deeper qualification at the middle stage of the funnel. This level of lead nurturing is a vital part of insuring that the leads handed off to sales are truly qualified and closer to closing. The Light at the End of the Sales Funnel. Looking for a good starting point to repair your sales funnel? Schedule a free, no-obligation phone call with the experts at ResponsePoint. Let’s brainstorm some ways to improve your sales funnel. We can discuss your specific pain points and help you find a customized solution. Are you interested in learning more about what it takes to repair leaky sales funnel with lead nurturing? Get in touch with the experts at ResponsePoin, for a no-obligation phone call. We’d be happy to give you a free phone consultation and answer any questions you may have.